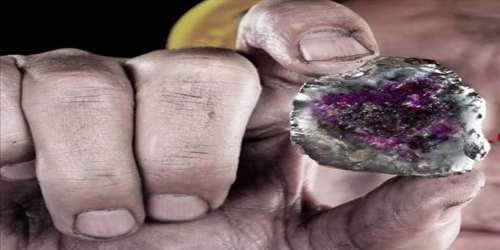 The mineral, named putnisite, appears purple and translucent, and contains strontium, calcium, chromium, sulphur, carbon, oxygen and hydrogen, a very unusual combination. It was discovered on the Polar Bear Peninsula in Shire of Dundas, Western Australia in 2007 during mining activity. Following identification and recognition by the IMA in 2012 the mineral was named after mineralogists Andrew and Christine Putnis. 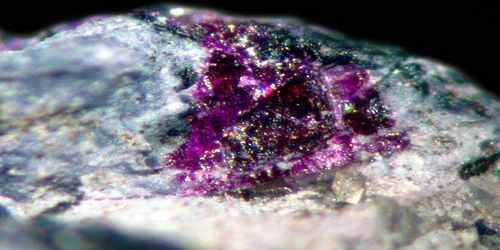 Miners in Australia were looking for gold and nickel when they came across the oddly colored purplish pink rock and had it sent to researchers for analysis. The mineral was sent to the Commonwealth Scientific and Industrial Research Organization which then sent the mineral to Dr. Peter Elliot, a research associate at the South Australian Museum and the University of Adelaide for further study. Putnisite occurs as small (< 0.5 mm) cube-like crystals in volcanic rock. The mineral formed during the oxidation environment within komatiite to dioritic bodies containing sulfide minerals. It has unique chemical and structural properties, and does not appear to be related to any of the existing mineralogical families. Crystals are translucent purple, but show distinct pleochroism (from pale purple to pale bluish grey, depending on the angle of observation) and leave pink streaks when rubbed on a flat surface. Putnisite combines the elements strontium, calcium, chromium, sulfur, carbon, oxygen and hydrogen: SrCa4Cr83+(CO3)8SO4(OH)16•25H2O. The mineral has a Mohs hardness of 1.5–2, a measured density of 2.20 g/cm3 and a calculated density of 2.23 g/cm3. Strontium ions (pink) in ten-fold coordination with oxygen. 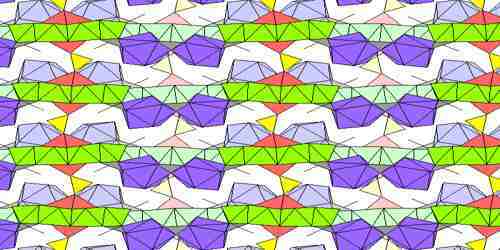 The coordination polyhedra are square anti-prisms capped with squere pyramids. In polyhedral terms, a gyroelongated square bipyramid. The strontium atoms are surrounded by a ring of eight chromium octahedra (green). We could nickname the Sr-Cr groups “saturn” groups. Each pair of chromium octahedra is also joined by a carbonate (CO3) group (gray). Calcium ions (purple) fit into the voids between the strontium-chromium “saturn” units and are linked to the carbonate groups and four chromium atoms. Pairs of Ca polyhedra share an apical atom. The coordination polyhedron is roughly an augmented square antiprism, with a square pyramid built outward on top of a square face. It’s a pretty distorted version of that ideal polyhedron. Minerals are usually named after the person who discovered them, in putnisite’s case, it’s named after mineralogist Drs Christine and Andrew Putnis. 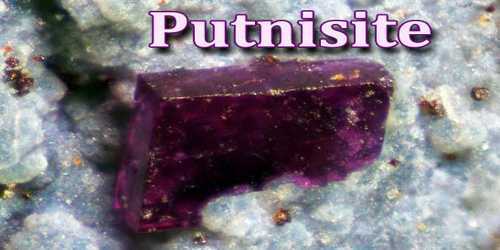 Putnisite is translucent, with a pink streak and vitreous lustre. The mineral currently has no commercial or practical use as it is too soft.